A LakeAir home air purifier will protect your family from harmful indoor air pollution. 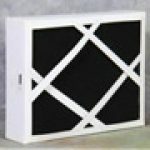 They are high quality air purification units that are simple to use and built to last for years and years. 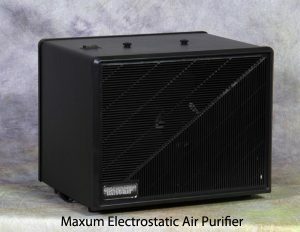 The Maxum Electrostatic Home Air Purifier is a commercial strength air cleaner for use in the home. The Maxum uses a washable cell that removes 97% of impurities to .01 microns. 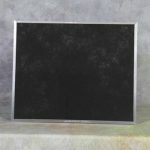 The activated carbon filter removes odors and VOCs. The high volume output of this units allows it to out cleans most so called “hepa” air purifiers. The Maxum costs about $64.00 a year to run, including 2 filter changes. That a much lower cost of use than a less effective “hepa” unit from the big box store. The Maxum will clean the air in a 600 sq ft room 4 times an hour. It removes dust, pollen, mold spores, pet dander, dust mites, smoke and many other air particles that makes us sick. Allergy sufferers and Asthmatics will find relief from their symptoms with this room air purifier. The Electrostatic method used by the Maxum to clean the air uses a 3 stage filtering system. In the first stage, the dirty air passes through the particle ionizer. Here the air pollution in the air is given a negative charge.The second stage is a series of collection plates. The dirty air particles are attracted to the plates and are trapped there until they are removed when the filter is washed. 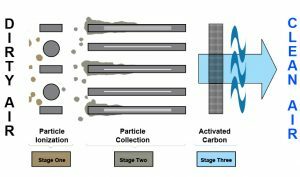 In the third stage the cleaned air passes through a activated carbon filter where odors and VOCs are removed by adsorption. 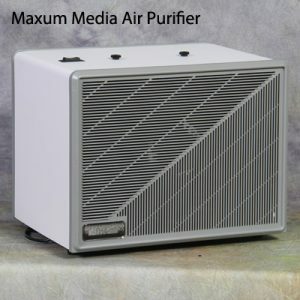 The Maxum Media Home Air Purifier uses a disposable MERV 11 media filter. 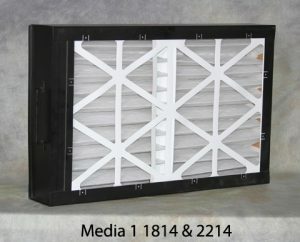 The air filter removes 98% airborne particles to 5 microns. It’s activated carbon filter removes odors and volatile organic compounds . The Maxum will clean the air in a room 24′ x 24′ 4 times an hour. It removes dust, pollen, mold spores, pet dander, dust mites and many allergens. These impurities are harmful to people with asthma, allergies the very young and old. How Air Filters Trap dirt. 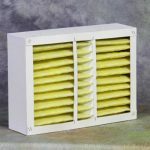 Filters work in an air purifier in 3 ways. These methods of trapping dirt particles are called mechanical methods. The first method is impaction. When a pollutant tries to go through the tight weave of a filter it is trapped. The second method is interception: When a dirt particle gets close enough to a filter fiber it is caught and trapped. The third mechanical method is diffusion.. In a filter, diffusion causes the smaller particle to move out of the main air stream. The small particle matter moves slower. Then, it is trapped by the first two methods. 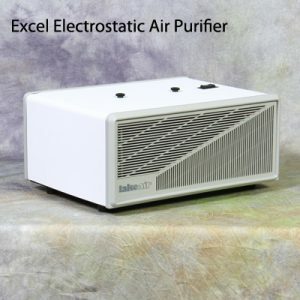 The Excel electrostatic home air purifier is a high efficiency, low maintenance air purification unit for the home. This room air purifier has a washable electronic cell that traps 97% of indoor air pollution. It is energy efficient. It uses about $1.20 of electricity a month. The replaceable carbon filter ( only $16.00) removes odors and typically last 3- 6 months. The Excel is highly portable and provides clean home air. 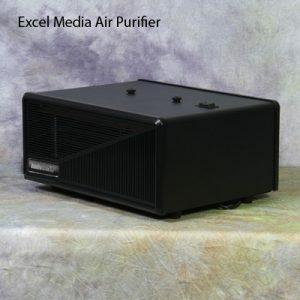 The Excel is a desktop portable residential electronic air purifier for home and office use. It will clean a 15′ x 15′ room up to four times per hour. The Excel is ideal for children’s bedrooms. They provide protection while they play and sleep. They clean the air removing pet dander, dust, pollen and other allergens. Allergy sufferers and Asthmatics will love the Excel. Because the Excel is so easily portable it is often used in Nursing homes to keep the residents room smelling fresh and inviting. The Excel Media is used in many VA Hospital rooms like those in Long Beach California and Honolulu Hawaii. Smokers love to use the Excel as a personal smoke-eater. Americans spend more time in their homes than anywhere else. Air pollution is more concentrated in our homes. Today’s houses keep more of the dirty air inside. This is why (IAQ) indoor air quality is so important. When you understand common indoor pollutants, you can control them. We want to you help reduce your health concerns and improve your family’s comfort. Indoor air pollution is among the top five environmental health risks. The best way to address this risk is to control or eliminate the sources of pollutants. Ventilating a home with clean outdoor air can accomplish this. Ventilation may be limited by weather or by pollution in the outdoor air. Use a home air purifier to clean the air in your home when it is not feasible to ventilate. Air Purifiers have been around for more than 150 years. Special needs drove early air cleaner development. Personal protection for firefighters was one of the first developments that lead to today’s modern air purifiers. Protecting ships from German U-boats was another demand sparked air purifier developments. Many technologies we depend on today came from world wide needs in the past. Today allergies and asthma affect more than 50 million Americans. The special needs of modern consumers drive the air purifier market. Consumers want air purifiers that remove air particles and gases. Immediate affects may appear after coming into contact once or repeatedly with a pollutant. As a result, you might experience eye, nose and throat irritation. Dizziness and a rundown feeling are common as well. These symptoms can lead to asthma especially in children. Furthermore, Studies have shown that up to 12% of children with asthma developed from exposure to mold or other air pollutants. Long term effects can show up years after exposure has occurred. Repeated exposure will only make the effects worse. Some of these effects include respiratory disease, heart disease and even cancer. It is wise to try to improve the indoor air quality in your home even if the symptoms aren’t immediately noticeable. As a result, your home will have cleaner air. Consider a residential air purifier as one tools in creating better IAQ for your home and family. The effects of indoor air pollution are even greater on the very young and old. Infants and young children have a higher breathing and heart rate and smaller bodies. Therefore they are exposed to more harmful affects. If the usual methods of addressing indoor air pollution are insufficient, a home air purifier like the LakeAir Maxum and Excel are good choices. Portable room air cleaners like the Maxum can be used to clean the air in a single room or in specific areas. They are not intended to filter the air in the whole house. A residential air purifier is a great part of your IAQ home protection plan. Some residential air purifiers are installed in the duct work of a home’s central heating, ventilating, and air-conditioning. These are known as whole house air purifiers. The LakeAir LAD and M series residential air purifiers are whole house air purifiers. Each purifier type has its own strengths and weaknesses depending on the needed application. The Canadian Mortgage Corporation performed a study and found that a residential air purifier like the LAD is one of the best values in improving your homes air quality. The LAD is a home air filtration system that mounts directly to the air handling unit of your furnace or HVAC. The LAD is designed to work together with your existing air handling system. In addition, the LAD is 97% efficiency to .01 micron of air Particulate matter. The M Series whole home air purifier is an affordable furnace accessory that transforms your furnace into indoor air pollution killer. The M Series attaches easily to most any existing forced air furnace. 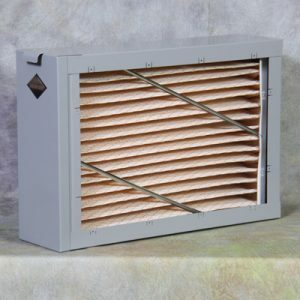 This unit features MERV 11 disposable filters that are 98% efficient. 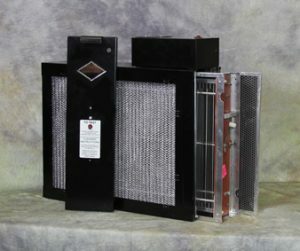 The Media 1 furnace filter frame mounts a powerful MERV 10 air filter to your furnace or air handler. 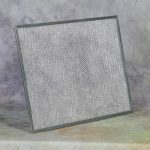 This filter removes 85% more pollutants from indoor air compared to standard furnace filters. 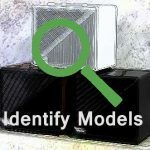 The Media 1 mounts to most furnaces or HVAC air handling units.